Makeup is pretty amazing and every other week a new video emerges showing just how damn impressive it can be. But this, well impressive it may be, but terrifying is what it really is. According to The Sun, these images were uploaded to Imgur yesterday, demonstrating some artistic might in capturing a living nightmare, leading many to complain that the makeup left them feeling dizzy or even ill just from looking at it. The model in the clip had eight additional eyes drawn onto her face as well as an extra couple of noses, and a few more lips too – why? I don’t know. But it’s pretty cool. The end result captures perfectly that horrendous vision which interferes with your perception of reality after far too many drinks – resembling almost the absinthe fuelled madness I imagine Van Gogh could not escape from as he sliced his ears off. Apparently, when you first gaze at the image, the mind is fooled into thinking that your vision has been blurred and it takes viewers a little while to even process what they’re looking at. 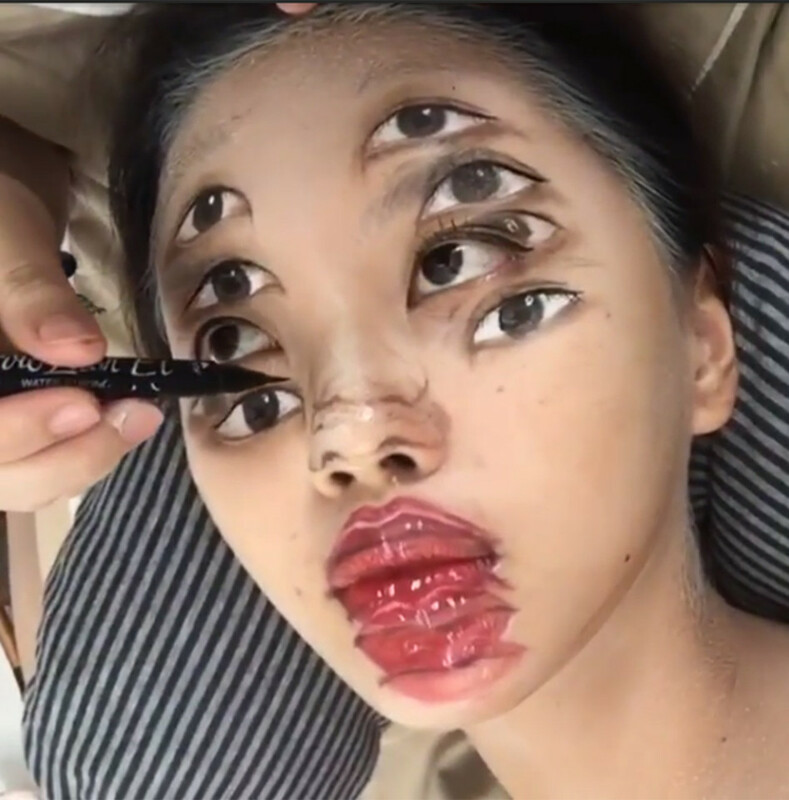 The mesmerising shots of the unusual face paint blown the minds of its viewers, as they praised the special-effects artist behind the design for the peculiar realism of her spooky facial additions. The mastermind behind the artwork is Thai special-effects expert Monticha Sriyoschati, who has also posted numerous snaps of the mind-bending illusion on her Instagram page. Personally, I won’t be having my make-up done like this anytime soon. It’s a bit too Pan’s Labyrinth for my scene.